Hari Ghotra is a chef and author who now runs the biggest digital Indian food platform in the UK. From the website, which is full of delicious recipes, videos and facts that will demystify the secrets of Indian cooking, to the app, where Hari delivers live cook-alongs weekly, you can create, share and enjoy fabulous Indian food in your home. She trained as a chef at The Tamarind Collection of Restaurants, which includes the Michelin-starred Tamarind of Mayfair and has recently launched a new bar for the Emirates Golf Club in Dubai highlighting her amazing dishes. 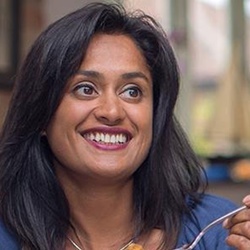 Her love for cooking began at home where she learnt the art of traditional Indian cookery techniques and age-old family recipes from her Mum. With frequent trips back to northern India, Hari experienced the vibrant culture and culinary specialities of the region. Hari started to run cookery classes, supper clubs and even pop-up restaurants. Today, Hari shares all of these recipes and cookery tips on her platforms to help you create delicious Indian food.